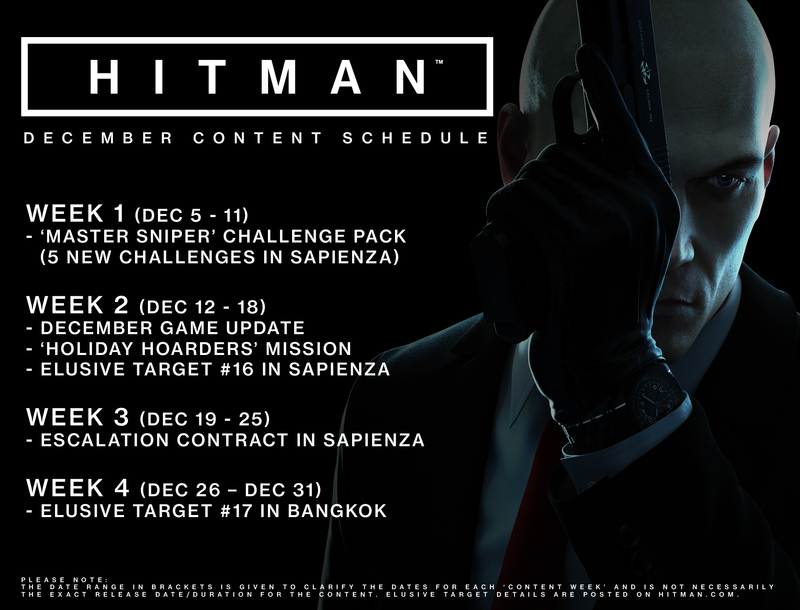 The HITMAN December Update is a mandatory update for all players and includes the Holiday Hoarders mission plus some general improvements to the game. ‘Holiday Hoarders’ is a free mission for all players, released in support of World Cancer Research Fund. The mission gives a festive feeling to the existing Paris location with snow, decorations and even presents, which have been scattered all around the palace. 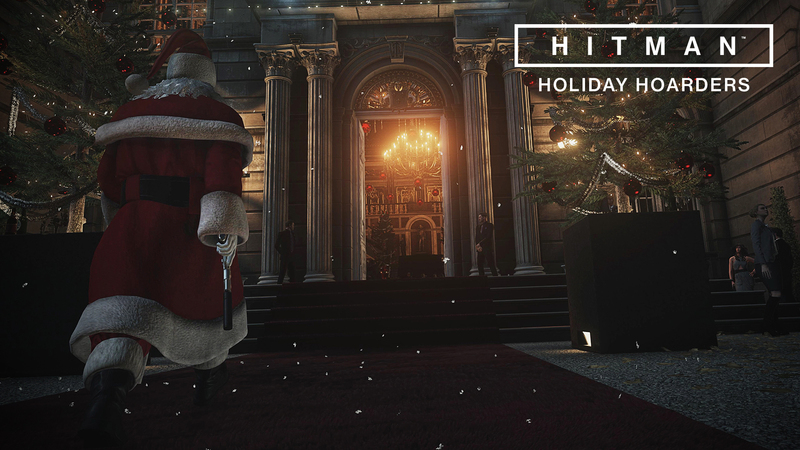 47 can open these presents and use whatever he finds inside to help eliminate his targets; two thieves who have gained entrance to the fashion show. - Added 3 holiday-themed items that can be obtained and used in the 'Holiday Hoarders' mission. - Added a holiday-appropriate way to exit the 'Holiday Hoarders' mission. Note: The 'Holiday Hoarders' mission will not feature any live content and it's not currently possible to create Contracts on this mission. Increased the quality of Supersampling filtering, to prevent the image from appearing blurry. This will affect PS4 Pro and PC. We've fixed an inconsistency with the names of targets in the Caden Compostion Escalation Contract. We've made sure that the game correctly recognises the new PS4 Pro Controller when it is connected to the PC version of the game. In this update, we've removed the ability for 47 to pull people over balconies or out of windows, when he is hanging on a ledge or below the balcony/window. There was a known issue for this move when it was introduced in our November update. It will be re-introduced with a game update in January when it is working as intended. - PC Only: We've fixed an issue that could cause an infinite loading state when using DX 12. - PC Only: We've fixed an issue that could cause noticeable drops in framerate on GTX 770. Great idea with the charity! Love you guys and thanks for creating my GOTY for 2016. Can't wait for season 2 Will be playing the christmas episode as soon as possible. say if I buy it like before jan 2nd do i still get the week 1-4 stuff? or does it vanish after the holidays.. The only game where basic gameplay functions are removed rather than fixed. Keep up the great work. Love the game, Nice gesture with the free content and related charitable cause. Cheeers. Great communication, new free content with no absurd micro transactions and in bonus, projecting right causes with the sucess of the game. You are doing it the right way ! W E W A N T N E W E P I S O D E O R M A P ! !